What Are the Common Constellations Found in the Sky? Is Orion's Belt Part of the Big Dipper? Orion may be the most recognizable constellation in the sky, with the possible exception of the Big Dipper stars. For one thing, it's visible practically everywhere on Earth. For another, Orion has a highly distinctive shape, and unlike many other constellations, it arguably resembles the thing it was named for – a hunter. For yet another, and complementing the aforementioned factors, Orion is home to two of the brightest stars in the sky. 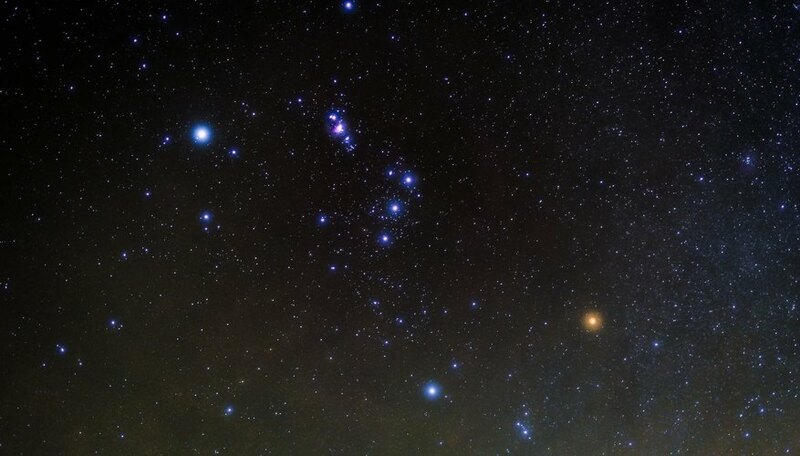 Orion's belt forms the center of the constellation, bisecting it into upper and lower halves. It even has a "sword" hanging from it, and the stars it includes also serve as a guide to important nearby celestial objects. Coincidentally, the portion of the sky occupied by Orion is home to a variety of interesting non-star objects, too. The sky currently includes 88 official, named constellations. 14 of these represent human beings, while most of the others depict animals of some sort. 29 constellations represent inanimate objects; one is even named after a head of hair. These were invented – perhaps "imagined" is a better word – by the ancient Greeks, as one might infer from the number of figures in Greek mythology that are represented in the constellations. Like the surface of the Earth, the sky can be divided into Northern and Southern Hemispheres (celestial, rather than terrestrial). Whereas points on Earth are described in terms of latitude and longitude, astronomy has units of right ascension and declination. Because the Earth rotates about its terrestrial poles, the heavens appear to rotate around the celestial poles. This means that inhabitants of far northern latitudes cannot see constellations that are close to the celestial south pole, because these are always below the horizon for such viewers, spinning once a day around a point that never comes into view. It is this information, in fact, that helps establish who came up with constellations in the first place; these astronomical artisans could not have lived further north than about 36 degrees North latitude based on the reach of the celestial atlas they concocted (that is, there were no constellations near the south celestial pole despite the presence of stars there). If you're too impatient to wait for nightfall or don't live in a place where Orion appears in the night sky at this time of year, you can consult an interactive online star chart (see Resources for an example) to get a sense of Orion's size, shape and relationship to nearby constellations. Chances are excellent that if you can't yet picture what Orion looks like, you'll have an "aha!" moment once you lay eyes on either a star chart or the real thing. Orion really is just that distinctive. Unlike a lot, even most, of the constellations, Orion arguably bears a strong relationship to that for which it is named: a hunter. To the perhaps less imaginative, Orion rather resembles a bow tie turned on one end, with prominent stars at the upper and lower left and right and a strip of three other prominent stars forming the narrow middle. These middle stars are actually the belt; the striking red star at the top left (Orion's right shoulder, assuming he is facing toward his human admirers) and the equally striking blue star at the lower right (Orion's left foot) are among the brightest in the night sky, which along with Orion's distinctive shape helps elevate its profile considerably. To find Orion's belt, you need only locate the constellation, as detailed later, and look for the neat line of three similar-looking stars spaced about equally apart. In order from left to right (i.e., from your left to right as you view Orion from the ground), these stars are Alnitak, Alnilam and Mintaka. (Remember that depending on the time of year, your view of Orion may change, making the belt look like it's been tilted to one side.) Alnilam is slightly brighter than the other two, but the difference to the human eye is negligible. Perpendicular to and below Orion's belt is a fainter line of stars, slightly closer to Alnitak than to Mintaka; this is Orion's sword, and the middle of the three visible "stars" in the sword is actually an accretion of very distant young stars (it looks sort of like a swarm of bees) called a nebula – in this case the Orion Nebula. 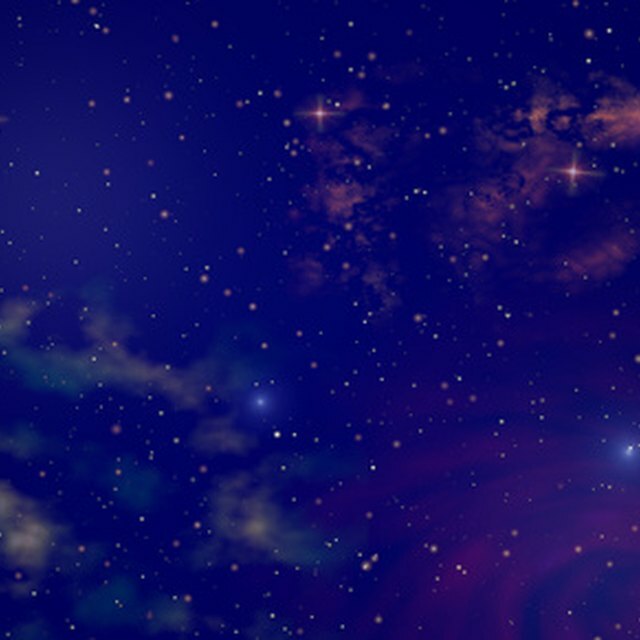 Fun trivia: A recognized collection of stars that is not a named constellation, but that is either contained within one or spans more than one, is called an asterism. Orion's belt is one, along with the handle of the Big Dipper, the "Summer Triangle" and the Winter Hexagon." Orion is visible at some point to virtually everyone on Earth, be they north of the equator or south of it. This is because Orion lies at roughly +5 degrees declination, which is the celestial equivalent of 5 degrees North latitude – in other words, very close to the equator. Were Orion far to the celestial north, it would not be visible to most residents of the Southern Hemisphere and vice versa. To people living in the United States and at similar latitudes worldwide – such as central Europe and much of mainland China – the best time to view Orion is at about 9 p.m. in the winter months. Winter often makes for better stargazing in general because colder air is usually less hazy, affording better views of stars, planets and more. Orion is part of the "Winter Hexagon" mentioned previously. This is a widely dispersed group of seven bright stars (one in a pair) in six different constellations. Starting from Rigel and moving clockwise, the rest of the hexagon includes Sirius (in Canis Major), Procyon (Canis Minor), Castor and Pollux (Gemini), Capella (Auriga) and Aldeberan (Taurus). Sirius is the brightest star in the sky, and the name of its parent constellation translates to "big dog," and as legend has it, Canis Major was Orion's faithful hunting dog. Conveniently, if you follow the line extending through Orion's belt from your right to your left, you will soon "run into" Sirius. Procyon is also a very bright star and sits in the "little dog" off the Betelgeuse side of Orion's upper body. Betelgeuse (pronounced "BEE-tel-joos") is the name of the most famous star in this famed constellation. Its formal name is "Alpha Orionis," with the Greek letter alpha given to the brightest star in a given constellation, beta to the second-brightest and so on. Betelgeuse is in fact the second-brightest of the stars in Orion, trailing its across-the-body comrade Rigel by a slight amount. But the apparent brightness of Betelgeuse waxes and wanes somewhat over time (Betelgeuse is what astronomers call a variable star) and at the time Betelgeuse was named, it looked brighter than Rigel (and no spectroscopic instruments existed in those days to confirm this). In any case, Betelgeuse is considered the 12th-brightest star in the sky. The name means "armpit of the central one" in Arabic, implying that constellations were shared between cultures. The blue giant star Rigel (Beta Orionis) enjoys less notoriety than Betelgeuse, but it is easier to say ("RYE-jel") and it claims the honor of being the 7th-brightest star in the heavens. Finally, Bellatrix, which marks Orion's left shoulder (or the right, when you look at the constellation), might appear quite bright in its own right (it ranks 22nd sky-wide) were it not by happenstance located so close to so many other literal luminaries. Beck, Kevin. "How to Locate Orion's Belt." Sciencing, https://sciencing.com/locate-orions-belt-5890330.html. 29 November 2018.